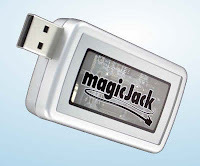 PINOYMONEYVANTAGE | Personal Finance in the Philippines: MAGICJACK - VoIP for everyone! MAGICJACK - VoIP for everyone! A magic of communication for everyone with a less cost, pocket-sized portability and ease of use at your fingertips. It was a wonderful present from a relative who have given us this new small device before my sister's return trip from the U.S.A last month. MagicJack became a rave in America for those looking for cheap alternative and cutting the cost of their telephone bills to half in making long distance calls to other states or even abroad. Most of the Voice Internet Protocol (VoIP) I know are internationally based like Vonage, Skype and others. The cost of having a connection with this companies is half from MagicJack's offer of US$20 to 30 for this small unit. MagicJack is plug and play. Just plug in your USB port and in one minute a program will appear to connect to your computer and the internet. MagicJack can be used anywhere as long as you have PC or laptop, internet connection with a broadband, WiMax, DSL plus an ordinary telephone handset. Works with cordless phone too. My MagicJack number is currently registered in New Jersey, USA even if I am living in Pampanga, Philippines and so it has been useful for the businesses with our prosective clients in and keeping in touch with our relatives in the United States and Canada. On my first day, my brother was able to contact my cousin in New York City who bought this device for us and it works even if it encountered some choppy reception but we still had a conversation for an hour. Even my sister used to contact also his buddy in U.S. at ease with this product.